The last of five suspects involved a string of Baltimore area armed robberies was recently sentenced to prison. 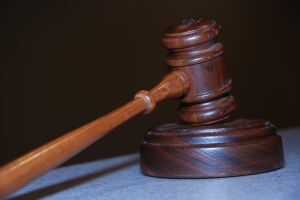 Maryland federal district judge Benson E. Legg handed down the 10 and a half year sentence, which also included a 3 year term of probation when the prison term expires. Judge Legg is the same federal district judge who just last month declared a controversial Maryland gun law unconstitutional (MARYLAND GUN LAW FOUND UNCONSTITUTIONAL). The robberies occurred during the summer of 2010 in various Maryland locations including Baltimore, Loch Raven, and Chambersburg. According to a U.S. Department of Justice press release the suspects conspired to commit the robberies in order to obtain money and prescription drugs. While it is unknown exactly how many robberies the five suspects were involved in planning or carrying out, the U.S. Attorney secured guilty pleas for the suspects in two separate robberies. The first robbery occurred at a Chambersberg, Maryland bank in July of 2010. Only two of the five suspects actually took part in this first robbery. One of the suspects was arrested on the scene while the other fled and escaped. The other three suspects were alleged to have taken part in the planning of this robbery. The second robbery took place in September of 2010 at a Baltimore area pharmacy. Three of the suspects took part in this robbery; two entered the pharmacy armed with guns but were not successful in stealing anything of value, while the other suspect waited outside in the getaway car. One of the suspects actually fired his gun during the attempted pharmacy robbery. Of the three suspects involved in the botched armed robbery, two were able to escape while the other was arrested on scene by Baltimore police. Other details of the pharmacy robbery that the U.S. Justice Department released were that the suspects obtained two handguns for use in the robbery in Baltimore City. Additionally, two days after the attempted pharmacy robbery the suspects set fire to the getaway car, a 1996 Dodge Neon. The suspects admitted to police that they set fire to the getaway car in an attempt to destroy any evidence of their involvement in the robbery. The other co-defendants pled guilty to conspiracy to commit robbery, attempted armed robbery, and use of a firearm during the commission of a crime. Two of the suspects that were not physically present during the robberies received 5 years in prison, while the two suspects that entered the pharmacy received prison sentences of 14 and 19 years. While bank robberies have been around for hundreds of years, and are even romanticized on television and in the movies, pharmacy robberies have become a recent frightening reality. Pharmacies are often targeted due to the presence of narcotic painkillers such as oxycodone and oxycontin. As addiction levels for these narcotics rise, so does the demand for street level sales. With and increased demand, comes increased potential for profit in illegal drug sales. Pharmacies are also seen as much more vulnerable to a potential robbery than a bank. Pharmacies are less secure than modern banks and often do not take measures to deter potential robberies. Benjamin Herbst is a Baltimore criminal defense lawyer specializing in Baltimore City and Baltimore County criminal defense. The Herbst Firm defends all criminal cases including robbery and gun crimes. If you or someone you know has been charged or is being investigated for robbery or any gun crime in Maryland contact Maryland robbery lawyer, Benjamin Herbst at 410-207-2598 24 hours a day, 7 days a week. Pa. man sentenced to 10 and a half years for robbery conspiracy, baltimoresun.com, March 24 2012. Man accused in Chambersburg bank robbery gets prison term, herald-mail.com, March 25 2012.